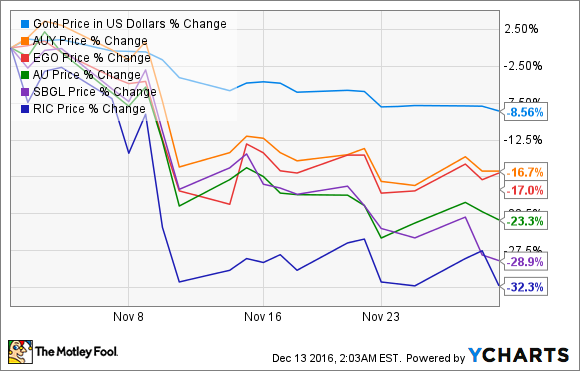 Shares of Yamana Gold, Eldorado Gold, AngloGold Ashanti, Sibanye Gold, and Richmont Mines all plunged following the election of Donald Trump. In what the market has interpreted as a boon for business, the election of Donald Trump drove the S&P 500 up more than 3% through November. At the same time -- much to gold investors' chagrin -- the price of gold fell about 9% during the same period. It comes as no surprise, then, that many of the market's largest gold stocks -- Yamana Gold (NYSE:AUY), Eldorado Gold (NYSE:EGO) , AngloGold Ashanti (NYSE:AU), Sibanye Gold (NYSE:SBGL), and Richmont Mines (NYSE:RIC) -- suffered double-digit losses. Shares of Yamana Gold, which had risen nearly 87% through the first 10 months of the year, fell victim to investors' fears over the falling price of gold as the stock dropped nearly 17% through November. The steep sell-off seemed like a bit of an overreaction in light of the company's third-quarter earnings, which it had reported weeks before the election. Yamana had several reasons to be happy with its Q3 performance. For one, the company reported a 3.3% year-over-year increase in revenue, according to Morningstar. In addition, it grew its operational cash flow to $176 million for Q3, or 126% year over year. More impressive yet was how this translated to free cash flow. Yamana reported $33 million in free cash flow for Q3 -- a marked improvement over the negative $25 million in free cash flow it reported during the same period in fiscal 2015. Another company that suffered at the hands of investors shaken by the fall in the price of gold was Eldorado Gold, a gold mining business whose portfolio is comprised of projects in both Europe and South America. Similar to Yamana, Eldorado Gold also saw its shares fall about 17%. Unlike Yamana, however, Eldorado Gold had far fewer things to celebrate from its Q3 earnings. In the third quarter, Eldorado reported $116 million in revenue -- a 45% drop year over year. Working our way down the income statement, we find that the company also reported an 11% year-over-year tumble in EBITDA. Turning to cash flow, it reported negative $26 million in free cash flow, though it was an improvement over the negative $40 million during the same period last year, according to Morningstar. Considering that the company reported these figures while recognizing an average realized price of $1,335 per ounce of gold during the quarter, it seems that investors' concerns were well warranted since the price of gold toward the end of November was less than $1,200 per ounce. Headquartered in South Africa, AngloGold Ashanti and Sibanye both maintain operations primarily in Africa. AngloGold's projects throughout Africa, for example, accounted for 63% of the company's Q3 gold production. All of Sibanye's gold-producing mines, on the other hand, are located in Africa. Both AngloGold and Sibanye saw their stocks plummet in November, dropping approximately 23% and 29%, respectively. The slides are understandable when taking into account the all-in sustaining costs (AISC) that the companies reported during their most recent quarterly earnings announcements. Used by the mining industry to measure how much it costs to dig the gold out of the ground, AISC is invaluable in assessing the efficiency of a miner's operations. AngloGold reported AISC of $1,071 per gold ounce in its last quarter, and Sibanye reported AISC of $1,062 per gold ounce. This means little without some context, so let's consider one of the industry's leaders, Barrick Gold, in maintaining low AISC. During the third quarter, Barrick reported AISC of $704 per gold ounce and guided for AISC to fall between $740 and $775 per gold ounce for fiscal 2016. Rounding out this roundup is Richmont Mines -- the smallest company in the group by market capitalization -- which fell more than 32% through November. Currently, the company has a market cap under $600 million and is closest to Eldorado Gold, which has a market cap of just under $2.4 billion. Presumably, with such a small market cap, an investment in Richmont Mines entails significantly more risk than its larger peers, so it makes sense that investors would flee from the stock as the price of gold fell through November. More than this, though, a look at the company's recent earnings report reveals further why investors would be reluctant to hold onto shares. For one, Richmont Mines reported AISC of $1,230 per gold ounce in its third quarter, and management is guiding for AISC to fall between $935 and $1,015 per gold ounce for fiscal 2016. In addition to an 8% year-over-year decrease in revenue, the company reported that net free cash flow for Q3 totaled negative $12.4 million -- considerably worse than the negative $0.8 million that the company reported during the same period last year. Although many investors had surmised that Trump's election would result in the price of gold climbing, the opposite in fact has happened. The price of gold declined precipitously through November, and all signs point to the trend continuing. If it maintains the same downward trajectory, gold stocks -- again -- will certainly suffer as well. But taking some time to appreciate what happened in November will help to provide insight into similar events in the months to come.